Manufactured by Premier Concrete Products, Inc. our erosion control products have proved themselves to be versatile and environmentally sound. 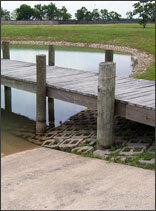 We provide a cost effective, flexible products to protect against natures harshest elements. Precast Revetment Block consist of concrete blocks cast in place and linked together by reinforcing cables (if required). Cables allow the revetment to articulate with changing soil and water conditions, providing protection for bridge abutments, flood control, levees, channels, canals and any where else hard armor protection is required.